Yesterday I met five Gold Medal Winners. Each of the ladies had won one of the coveted Gold Medals awarded by the Royal Horticultural Society at the Annual Botanical Art Show at the Horticultural Halls in London. This is a truly international event. The 24 participating artists came from Australia (1), France (1), Italy (3), Japan (4), the UK (13) and USA (2) and the gold medal winners came from Australia, Italy, the USA and the UK (2). One of the bonuses of being a gold medal winner is the RHS often buys a sample of your work for its collection (if it hasn't already been sold)! In this review I'm focusing on the gold medal winners but there was a lot of excellent artwork on display and this exhibition should be a "must visit" in the diaries of any botanical artist who can get to London. 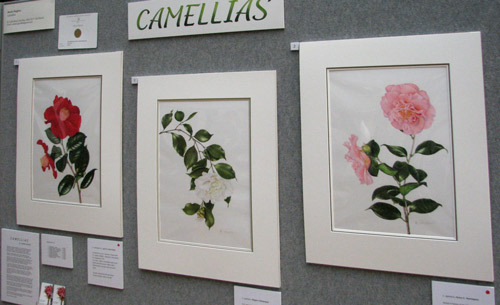 Annie Hughes (NSW, Australia) painted a stunning set of nine Camellias. Her paintings achieved a fine balance between rich saturated colours and delicacy in terms of the gradations and subtleties of colour in the blooms. Her work is outstanding - I turned the corner to view her work and immediately started to ask myself "where's the gold medal winning certificate?" Originally from Santiago; Chile, Annie Hughes has become a popular Botanical artist in Australia. Her paintings have been exhibited at the BASA annual exhibition twice, at Canberra Botanical and have also been seen at the BASA Wildflowers exhibition at Parliament House in 2006 and Botanica 2005, 2007, 2008. Her keen eye and sensitivity to texture has resulted in her being awarded the 1st Prize for Australian Natives and 1st Prize Peoples Prize both at BASA 2005. Her work is enjoyed in private collections in Australia, the USA and the UK. 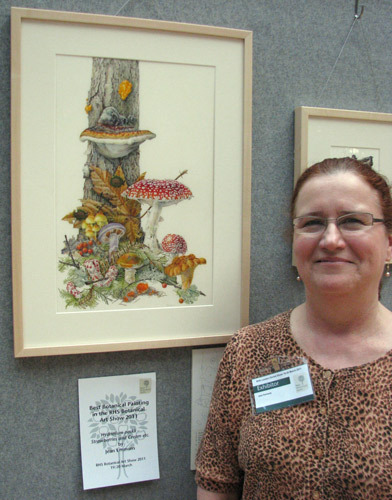 Jean Emmons (Vashon Island, WA, USA http://www.jeanemmons.com/) displayed a set of watercolour paintings of fungi - Common mushrooms of the Pacific Northwest, United States and won the prize for Best Botanical Painting in the show as well as being awarded her second Gold Medal. All of Jean's watercolour paintings are on stretched vellum - which I'll be coming back to in a future post. Jean’s technique is based on medieval manuscript illumination. The colour and saturation of the watercolours is amazing. This is a painter who is a true colourist at heart so nobody will be surprised to know that I found her work absolutely delightful as well as exceptionally high quality. I see from her website that she had work in last year's exhibition at the Shirley Sherwood Gallery at Kew Gardens "Portraits of a Garden — Selections from New York’s Brooklyn Botanic Garden Florilegium Society”. I now realise why her work seemed vaguely familiar! Jean told me that her work which won the award for being the Best Botanical Painting in the show took her five months to complete working 8-12 hours a day. Her smaller work typically take a month to complete. In 2005, Emmons received a Gold Medal from the Royal Horticultural Society for an exhibit of paintings of Pacific Coast irises. 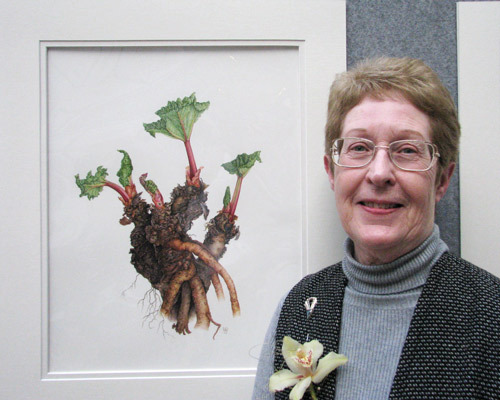 Also in 2005, she won the prestigious American Society for Botanical Artists Award for Excellence in Botanical Art. Her work is included in numerous collections including the Hunt Institute for Botanical Documentation, the Royal Horticultural Society’s Lindley Library, and the Shirley Sherwood Collection. 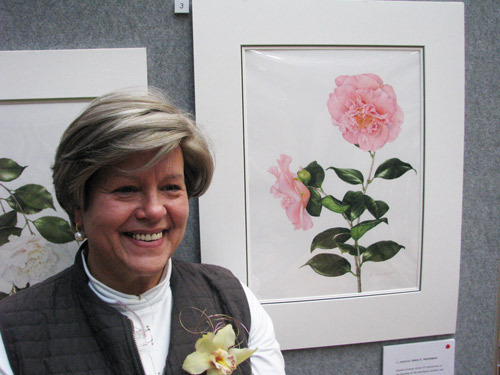 In 2007, she won “Best in Show” at the International Botanical Art Exhibition at the Horticultural Society of New York. Norma Gregory won her third Gold Medal at this show. 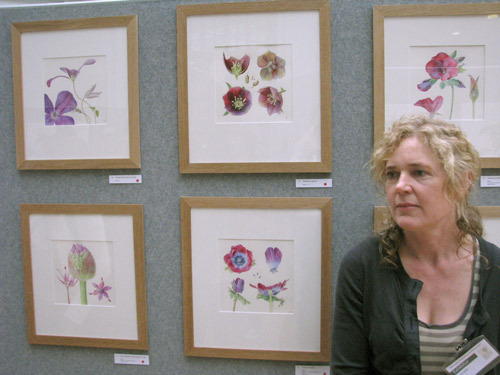 Norma is a natural history artist who only started doing botanical art in 2006. She won her very first Gold Medal the same year which is some feat! Norma's display was all about roots and root vegetables. I'm always very drawn to those who display the less showy parts of plants and Norma had a really great series of paintings about roots - I absolutely loved the rhubarb (see above)! Carolyn Jenkins (London, UK http://www.carolynjenkins.co.uk/) won Best Exhibit in show for her set of paintings developed around the theme of The Anatomy of Flowers. You can also see these on her website. Her series of watercolour paintings had some truly beautiful glazes to convey the subtle colours of some of her subjects. I loved her approach to design which is truly contemporary while maintaining an informative botanical approach to her subject matter. All in all an extremely pleasing and well presented set of botanical paintings. 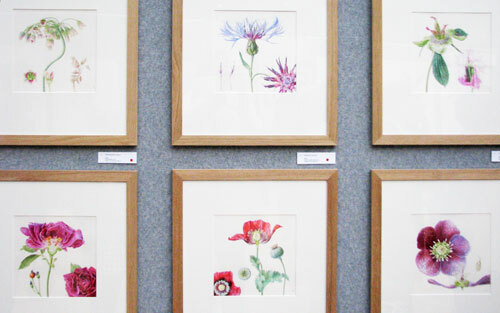 Carolyn's work also demonstrates that botanical paintings don't need to be large to be very effective. Lidia Vanzetti (from Italy http://floraviva.org/LidiaVanzetti.html) has won her second RHS Gold Medal with her very pleasing series about the Pears of the Piedmont. 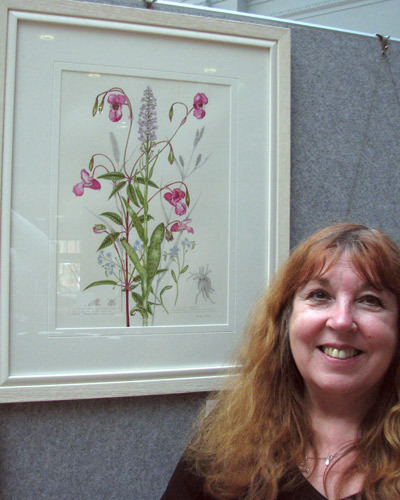 Lidia is actually a primary school teacher and does all her botanical art in her spare time! Another artist I spoke to at the exhibition was Marilyn Wheeler who had chosen to do a display about Orchids of Damp Woods and Meadows. Little did Marilyn realise it but she has already featured on this blog when I did the reviews of the Annual Exhibition of the Society of Botanical Artists in 2009 and 2010 - the latter being when she won of the Certificates of Botanical Merit. 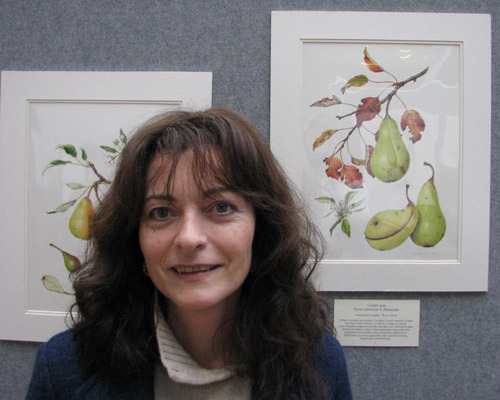 Marilyn got a Distinction when she completed her Society of Botanical Artists Diploma in 2009. In terms of art supplies I can to tell you there's massive endorsement for Daniel Smith watercolours - particularly the quinacrodines - and the Winsor and Newton Permanent Rose (another quinacrodine PV19) and Winsor & Newton Winsor Violet (Carbozole dioxazine PV23). I also learned a lot about stretched vellum of which more in another post! Oh my gosh, what talented artists - I love all of the botanical art featured, particularly the work of Carolyn Jenkins. I thoroughly enjoyed reading this post Katherine - thank you for the review and pics. The rhubarb is fantastic!! Wonderful bautiful botanicals. Thank you for making the effort to go and then showing them on this favorite Blog of mine. I want to see them for real. This wonderful post will last me all week, Katherine. How I wish I could see the exhibition IRL - how I wish I had such a rhubarb root IRL too! My husband and i were very lucky to go and view this exhibition on Sunday. I spoke to some of the above artists and gathered some wonderful memories and advice! 27th March 2011 - Who's made a mark this week? 20th March 2011 - Who's made a mark this week? Fancy painting in Provence in May? 13th March 2011 - Who's made a mark this week? 6th March 2011 - Who's made a mark this week?